A photo from the early days! How time flies! At Sparks & Favor, we were interested in the new technology from nearly its beginning. Dr. Sparks recalls those first cases in 2009. He wondered whether women would accept the new “robotic” technique. 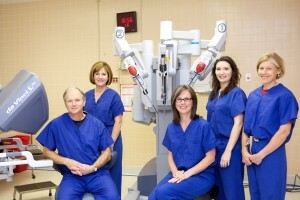 He assured them that the robot did nothing independent of the surgeon. But he and his patients were quickly impressed by the results. He recalls, “Patients required less narcotic medication, and they were usually up and about, tolerating food, and ready to go home the day after surgery.” Moreover, he no longer had to advise a woman needing a hysterectomy that she should plan a month to six-weeks away from her job or other responsibilities. With some precautions, many patients felt ready to return to their normal lives within a week or two. Fast forward ten years, Brookwood’s announcement of these numbers made us curious about our own experience. We were surprised to count that our physicians at Sparks & Favor have performed nearly 1000 of them! More important for our patients, our experience with such a large number and variety of cases means that we are almost always able to avoid an abdominal incision. A word of caution, occasionally the reason for the hysterectomy—such as certain cancer diagnoses—makes an abdominal surgery a better choice. But, examining the past 5 years, we have been able to offer a minimally-invasive surgery to 95% of our patients needing hysterectomy. We recommend surgery for a GYN problem conservatively, first offering non-surgical treatment where appropriate. Nonetheless, we know that around a third of women will be contemplate a hysterectomy before age 60. The robot has been a great stride forward. We commend the Women’s Medical Center at Brookwood for investing early in this important resource for Birmingham women. And we proudly celebrate the hospital’s milestone achievement and ours!